Mercury is a toxic substance that can harm both humans and wildlife. Many different products, including thermometers, contain mercury. When these products break, the mercury can evaporate, creating a risk of dangerous exposures to mercury vapor in indoor air. Moreover, mercury that volatizes when products break in the home or in the waste disposal system enter the environment and can be deposited in lakes and rivers, where it can be transformed into highly toxic methylmercury. Very small deposits of mercury can do significant damage. One gram of mercury per year is enough to contaminate all the fish in a lake with [a] surface area of 20 acres. A representative of the Ecology Center in Ann Arbor testified before the House Commerce Committee that "mercury attacks the central nervous system and can cause tremors, impaired vision and hearing, developmental deficits during fetal development, attention deficit, and developmental delays during childhood." Fetuses and children under six are said to be especially vulnerable. The contamination of lakes and fish by mercury is said to be an important public health problem. As mentioned, one source of mercury is the mercury thermometer. (Other product sources include batteries, automobile switches, and fluorescent bulbs. Coal-fired electric utilities, municipal waste combusters, and medical waste incinerators are said to be the principal sources of mercury in the air.) Environmentalists say that mercury thermometers are responsible for ten percent of the mercury in the municipal waste stream. Moreover, they say, in one recent year, poison control centers received 18,000 calls from people who had broken a mercury fever thermometer in the home. While health officials say that breaking a thermometer is not likely to threaten an individual's health, they report that there have been cases of serious illness and even death related to the exposure to mercury from fever thermometers; young children are said to be most susceptible. The EPA has said, "Clearly, thermometers are not the major source of mercury to the environment, but they are a meaningful small source that can be relatively easily reduced". Environmentally safer and affordable alternatives to mercury fever thermometers are readily available, including digital electronic thermometers. As a result, a number of states have banned or limited the sale of mercury thermometers, including California, Oregon, Rhode Island, Maine, Maryland, Indiana, Minnesota, and New Hampshire. Some local units of government across the country have issued bans as well, including Ann Arbor. A recent report from the American Academy of Pediatrics called for the end to the use of mercury-containing thermometers, according to an AAP press release. Reportedly, the EPA and the American Hospital Association have signed a memorandum of understanding agreeing to try to eliminate mercury from health care, and some national retail chains have stopped selling mercury thermometers. Legislation has been introduced that would ban the sale (with some exceptions) of mercury thermometers in Michigan. The bill would amend Part 172 of the Natural Resources and Environmental Protection Act (NREPA) to prohibit, beginning January 1, 2003, a person from selling, offering to sell, or offering for promotional purposes a mercury thermometer in the state or for use in the state, except in certain specified circumstances. The bill would permit a mercury thermometer to be sold or offered when its use was required by state or federal statute, regulation, or administrative rule or for pharmaceutical research purposes. The bill would permit the sale or offering of mercury fever thermometers by prescription. A manufacturer of mercury fever thermometers would be required to supply with each thermometer sold by prescription clear instructions on the careful handling of the thermometer to avoid breakage and on proper cleanup should the thermometer break. The bill's provisions would be enforced by the Department of Environmental Quality. A violation would be a misdemeanor punishable by imprisonment for not more than 60 days or a fine of not more than $1,000, or both, plus the costs of prosecution. The term "mercury thermometer" would be defined to mean a product or component, other than a dry cell battery, of a product used for measuring temperature that contains mercury or a mercury compound intentionally added to the product or component. 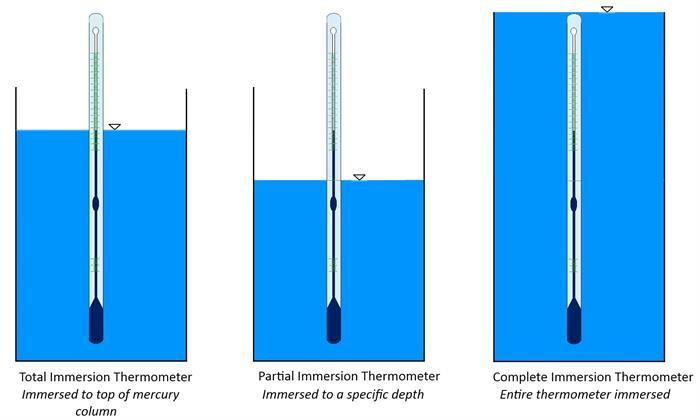 A "mercury fever thermometer" would be defined as a mercury thermometer used for measuring body temperature. The web site of the federal Environmental Protection Agency contains a great deal of information on mercury generally and on mercury thermometers. The address is www.epa.gov. Proponents say that the bill represents a small but significant step in reducing the threat to the environment and public health from mercury. Michigan would join the list of states (and local jurisdictions) prohibiting or limiting the sale of mercury thermometers. While the obvious benefit from banning mercury thermometers is to individual households, there will also be some benefit to society at large. The federal EPA notes that when mercury thermometers break or are disposed of, say in incinerators, mercury enters the environment. The agency has said that "combustion of various mercury-containing products in municipal solid waste is the second largest source of mercury to the environment [and] the fourth largest source . . . is combustion of medical wastes. These two categories together account for nearly one-third of the mercury released to the atmosphere". Federal officials say mercury thermometers contribute 17 tons of mercury each year to the municipal solid waste stream. And each year thousands of people break mercury thermometers in their homes. There are a number of suitable alternatives to mercury fever thermometers; indeed, some retailers have already stopped carrying the mercury thermometer. The bill takes a prospective approach; it does not anticipate removing existing mercury thermometers but prohibiting future sales.It should be also noted that the bill allows for special circumstances when such thermometers may be necessary. At the request of several States, ASTM International has issued a directive to all technical committees to review their standards that reference mercury containing instruments or mercury methods and determine the technical and economic feasibility of replacing them or substituting with non-mercury instruments or methods. A number of States have banned the sale of mercury containing instruments, including ASTM mercury thermometers, making it difficult for users in those States to comply with ASTM standards. In most cases, the instruments in question are the mercury-in-glass thermometers specified in ASTM E1. These thermometers have long been the gold standard temperature measurement devices in many ASTM standards. In this presentation we will review the ASTM directive, including how to communicate the technical committees’ resolutions to ASTM; technical issues in replacing mercury containing devices with other devices, especially the thermometers found in ASTM E1; legal issues involved with this project, including which States have bans and how the bans differ from State to State. 1) Pour your sample into a smooth, clear cylinder or jar that is dry or well rinsed with a portion of the sample. 2) Make sure your sample is thoroughly mixed before testing. 3) Immerse the hydrometer in the liquid to a point slightly below the place where it naturally floats. Make sure the hydrometer and liquid are at rest and free of air bubbles. 4) Measure the temperature of the sample. Ideally, the sample temperature should be equal to the temperature standard of the hydrometer, generally 60°F. If temperature differences are unavoidable, correction tables can help to adjust readings (see link under image) or call our Applications Specialists for information. 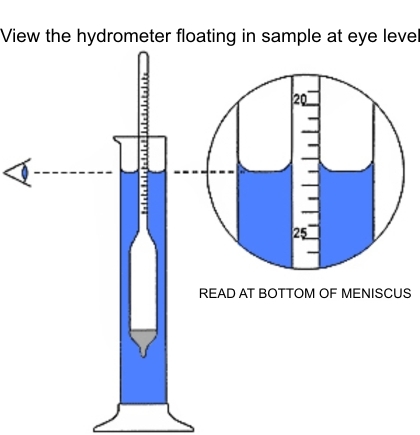 5) Take your reading at the point where the surface of the liquid crosses the hydrometer. The most common industrial instrument for measuring liquid density is the hydrometer and the most common of the hydrometers used to measure brine strength is the Salometer. Occasionally a special type of Salometer is used in the canning industry and for testing brine used in quality grading. It is graduated on a scale where 100ºS represents brine containing 25% salt, instead of saturated brine containing 26.395% salt. Ordinarily, Salometers are scaled for reading at a temperature of 60ºF, but special Salometers are available for the meat packing industry scaled for readings at 38ºF. Select a clean. straight-walled glass cylinder with a diameter at least twice that of the salometer bulb and with sufficient height to allow for complete immersion of the salometer scale. The cylinder should be tall enough to allow the salometer to float at a O°S reading. Place the cylinder on a level surface and fill with a sufficient volume of brine to raise the liquid level near the top of the cylinder after the salometer is immersed. Record the brine temperature. lf significantly different than 60°F, a temperature correction to the reading will be necessary (see chart). Carefully immerse a clean. dry salometer into the brine. Assure that the salometer is floating and not touching the cylinder walls. After the salometer has stabilized. take a reading at the brine surface at eye level at the bottom of the miniscus. the concavity formed on the cylinder walls at the brine surface (see illustration). Check new salometers by first placing them in clear water, where the reading should be nearly O°S at 60°F. Empty the cylinder, rinse it with saturated salt solution and then refill with saturated brine at 60°F. The reading should be near 100°S’and not less than 98°S. Considerable error may result from readings made with the correct Salometer at the correct temperature if proper procedure is not used. The following suggestions will help in securing correct Salometer readings. Temperature of the brine should be the same as specified in the brine table being used. A 60ºF Salometer will not give a correct reading at 38ºF and vice versa. Brine should be tested only in a straight walled cylinder of clear glass, set solidly on a level surface. Any moisture that collects on the outside of the cylinder should be wiped off. Make sure that the Salometer stem is dry, clean, and free from grease, or caked salt crystals, and that the Salometer does not touch the sides of the cylinder when readings are taken. Check new Salometers by placing them first in clear water, when the reading should be 0ºS at 60ºF. Empty the cylinder, rinse with a saturated salt solution, then refill with saturated brine at 60ºF. Salometer should read 100ºS. Care must be taken to read the scale marking at the actual surface of the brine when the Salometer has come to rest. This brine surface is not level, as brine tends to rise along the sides of the cylinder and along the stem of the Salometer, forming a concave surface known as a meniscus. For a correct reading, bring the eye to a point level with the bottom of the meniscus. Density is defined as weight per unit volume (pounds per gallon, grams per milliliter, pounds per cubic foot, etc.) Specific gravity of liquids and solids is the density compared with that of water at 4ºC. (3) by means of hydrometers, weighted glass floats which sink in the liquid to a depth dependent on the density, which is read at the liquid line on a calibrated stem extending above the liquid. (3) in arbitrary divisions, such as degrees Baumé (Be.) degrees Twaddell (Tw. ), degrees Salometer (S.). Salometer by far the most common of all the hydrometer scales used for testing brines. The scale indicates directly the percent saturationof the brine, reading 0ºS in pure water, and 100ºS in fully saturated brine. Since saturated brine contains 26.395% salt by weight, each Salometer degree represents 0.26395% salt. Baumé an arbitrary scale originally intended to indicate % salt in brine. ºBe = 145 145 Sp. Gr. Brix (Balling) used in the sugar industries; each degree Brix represents percent sugar (sucrose).